The propresidential faction leader can become the top prosecutor any day now. President Petro Poroshenko has submitted to parliament a draft resolution that proposes it to rubberstamp the appointment of Yuriy Lutsenko as the nation's top prosecutor. The law on amendments to certain legislative acts of Ukraine regarding the Prosecutor-General's Office of Ukraine adjusted the qualification requirements to a candidate for the top prosecutorial post. Under the amended law, a person, with a higher education degree and work experience of at least 5 years in the field of law or experience in a legislative and/or law-enforcement body, may be appointed to the post. Previously, the law required a candidate to have a law degree and five years job experience as a prosecutor. 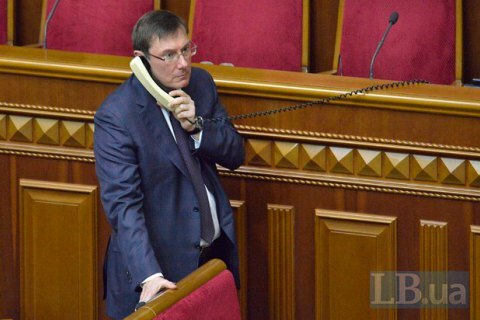 Lutsenko has no such experience. Speaker Andriy Parubiy and President Petro Poroshenko signed the bill within two hours after the vote. Yuriy Lutsenko, 51, earned his degree in engineering in 1989 from of Lviv Polytechnic Institute. He has been engaged in politics since 1994 when he was elected to the Rivne regional council. During the Orange Revolution he was one of the "field commanders" of the Maydan. In November 2004-January 2005 he was a member of the National Salvation Committee. After the revolution, he was appointed interior minister, becoming the first civilian in the history of Ukraine to head the Interior Ministry. After his dismissal in late 2006, he became an adviser to President Viktor Yushchenko, and then was elected to the Verkhovna Rada on the list of the Our Ukraine-People's Self-Defence bloc. In the same year, he returned to the cabinet as interior minister. In January 2010, after Viktor Yanukovych came to power, he was dismissed and sentenced to four years in prison on charges of abuse of power, misuse of public funds. He served his sentence in penal colony No 91 in Mena. In December 2013, he was pardoned and released from prison. In 2014, he was elected to parliament on the list of the Petro Poroshenko Bloc, whose faction he later headed.